Includes: 1 controller, Audio/Video cables, power cord. Does NOT include games, RF adapter. There is also a $199.99 version which comes with the network adaptor. Add to that the fact that the Playstation 2 also plays the old Playstation games and you have a machine with the largest library of games currently on the market. The Playstation 2 got off to a slow start in terms of exclusive games however. The initial set of games available Christmas 2000 left many gamers cold and in Japan most people who owned the Playstation 2 used it for playing DVD movies more than for playing games. That initial drought has more or less ended a year later. There are a wide variety of other devices that can connect to the Playstation 2, including keyboards, mice, steering wheels, light-guns, etc. A modem or network card for internet connectivity recently became available, but so far they are in very short supply. Look for a hard drive in the near future as well. It's also important to note that no system for the past several years will plug directly in to some older television sets. They all use 3 wires, one for video (usually a yellow plug) one for left hand audio (white plug) and one for right hand audio (red plug.) If you look on the back of your television and see either 2 screws (really old televisions) or a single jack with screw threads on it, then you will	need an added device to use ANY of these machines on your set. This device is called an RF adapter, it will	connect either to the two screws or to the threaded jack and allow you to play games through the older set. In most cases your VCR will already have the correct connections on the back and all you have to do is connect	the game machine to the VCR. So what should I buy? The machine is $200 and if you intend on playing both Playstation and Playstation 2 games then you will need memory cards for both formats. There are two controller ports for multi-player games so you might want to get another controller as well. There is what's called a multi-tap which allows up to 8 players at the same time, but you should see if any game you want to play supports the multi-tap before you run out and buy one. While you can play DVD movies by simply using the controller I would reccomend getting a real remote control. There are several available. I like to sit back and relax while watching a movie, not stumbling around with something connected to a wire. There's also the danger of someone tripping on the cord during the movie. The true A-List Playstation 2 titles are all fairly new releases so you should have no trouble finding them. For parents be aware of the rating system as all games are not appropriate for all ages. Devil May Cry is one that is both very popular and heavily advertised. For racing fans there is Gran Turisimo 3 which is usually abbreviated as GT3, not to be confused with GTA3, Grand Theft Auto 3, a mature game which lets the player engage in car-jackings and other questionable behavior. For the more fantasy minded there is Ico and action fans will enjoy Twisted Metal Black. By far the most anticipated game on the system is Metal Gear Solid: Sons of Liberty which became available on November 15th, 2001. The big hits for the Christmas 2002 season are titles like Ratchet and Clank and Sly Cooper and the so incredibly "M" rated Grand Theft Auto: Vice City. Yes, it's rated "M" for a reason, kids. 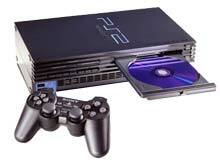 At $200 the Playstation 2 is the same price as an Xbox and it doesn't have anywhere as many features (such as a built in hard drive for saving games and music or a built in network card for multi-player gaming.) Its two-year old technology looks severely dated when compared to modern games on the Xbox and Gamecube. That being said, there are more games released and being released for this platform than any other and at $200 it's hard to go wrong with it.